You SEW Girl: Back in the saddle and captured on video (...metaphorically speaking... and not simultaneously). Back in the saddle and captured on video (...metaphorically speaking... and not simultaneously). On Saturday, I began this year's teaching schedule with Customised Bag in a Day class. It was good to get back into the groove, meet some new people and see some fab new bags coming into being. We didn't video the class (nor me in a saddle).... more of that later. I have a busy few weeks ahead, with a Zippers For Bags class next weekend, followed by Grampians Texture and then Large Tote (Bag in a Day) and Purse Frame classes at Addicted To Fabric in Canberra. 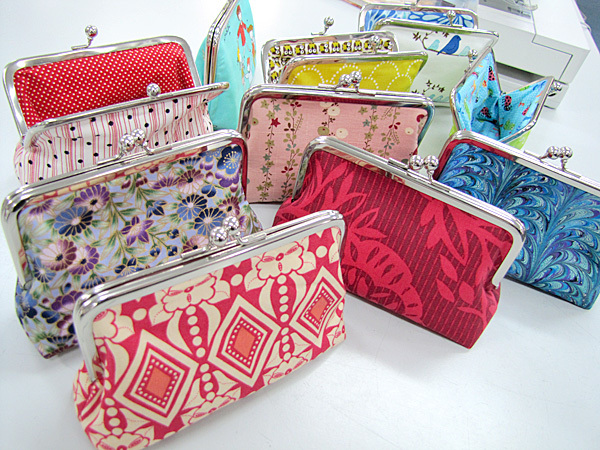 Then there's the Purse Frame workshop in my studio on 16th March. We've had 2 cancellations for that day, so if you were hoping for a spot, here's your chance! Having spotted a spare weekend just before Easter, and a waiting list or two, I thought that perhaps I could squeeze in another class, so we'll now run Beginner's Bag in a Day on 23rd March. If you're getting an "Active X" warning on the page as you view my website, please know that it's just something to do with the old SSL certificate from the online shop, and I've asked Joe the Super-Hero-Techie to see if he can sort it out for me. It's not the hacker still at work. Stitch 56 (a major You SEW Girl stockist) are celebrating the launch of their spanking new website with specials and interviews with designers and all manner of good things (including 2 copies of my book at 15% off for the lucky first-ins). You can check out the details here, and follow Stitch 56 on Facebook or Twitter to get next week's deals. I'll be back soon.... I'm cooking up a blog post about interfacings as we speak. Nikki, thanks so much for the huge rap for Stitch 56! I hope everyone loves our movie, and do come play with us on Facebook - we're playing Boggle 56 with some very familiar word groups! And you can win an extra-juicy discount when you shop! From one hand gesticulator to another, you're awesome!! Great article.. i love Stitch 56 and his style! Love the interview, and the location - all those lovely things surrounding you! Hi Nikkie, I love your designs of purse and congratulation on your interview. You deserve the best because you are the best.